Got a late start this morning after getting home super late. Yep, another Bunco party, the second in a sort-of-annual event. It was mostly the same crowd as last year, a great time, and my wife pocketed $100 which easily covered the baby sitter. Oh, and the food was awesome: shrimp cocktail, stuffed mushrooms, sausage and peppers, meatballs, and these spectacular bacon-wrapped jalapeno cheesy-poppers! Now, it was a Corona type night if you know what I mean. So I decided to "expand my horizons" and dive right into the Patron. I have no idea what a good tequila or tequila brand is, but I'm pretty sure this was one of them. Ultra smooth! I passed on the Apple Martini, and checked out a Bartles and James Pina Colada something and a Jack Daniels Lynchburg Lemonade. They were a little sweet, but not bad, and certainly prepped my palate for some Mexican beer. Until next year. If I were you, I'd click the link above to read last year's recap--I think it's more entertaining. 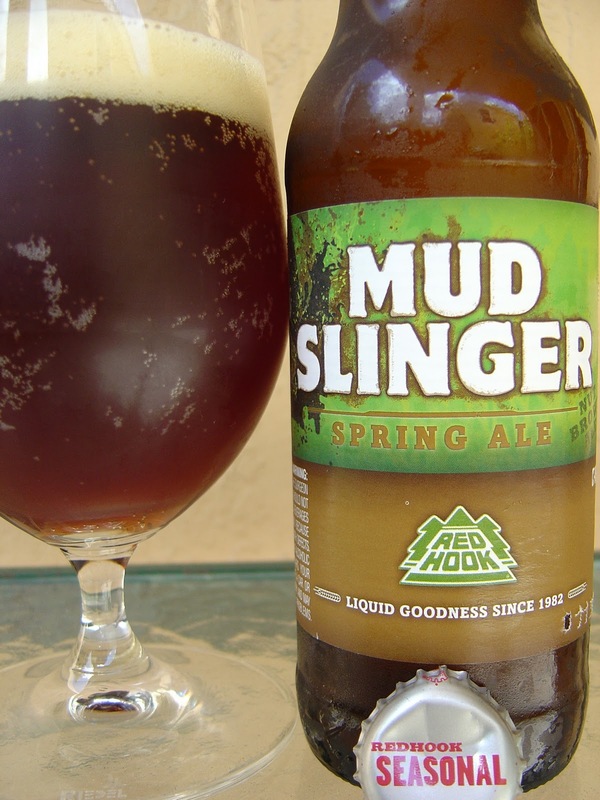 Today I'm drinking Mud Slinger Spring Ale brewed by Redhook Ale Brewery in Portsmouth, New Hampshire. This is one of their seasonals and the label calls it a nut brown ale. In fact, the label is so simple that the words "NUT BROWN ALE" and "Bottled 011911" are easily the most exciting part of the bottle design! Malty, nutty aroma with plenty of lemony hops on top of that. The flavors begin a bit nutty, a tad grainy, earthy, some caramel. Next, those sweeter flavors are offset literally by some off medicinal flavors. A high dose of lemon bitterness is next in line, way out of place and unwelcome. Low body, high carbonation, dry finish. The 5.8% alcohol was not really in play. OK at best and tough to finish. Thank God I had a 60 Minute to take away the pain! I bought mine from the "whim singles" section at Total Wine too. Gets you every time!